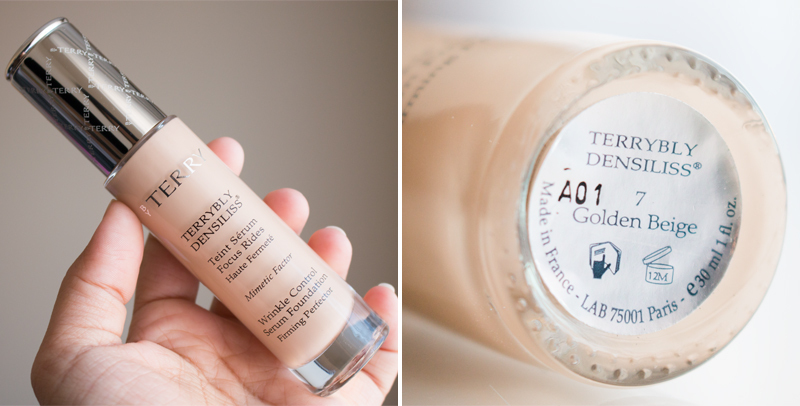 To say that I was excited to get my hands on this foundation is an understatement; ever since I heard the lovely Amelia Liana raving about the By Terry Terrybly Densiliss Foundation, I knew I had to have it – Amelia has never recommended a foundation that I didn’t love, including my beloved Giorgio Armani Luminous Silk. So, when found myself within a short walk from Space NK, I decided to pop in and get myself colour matched – this foundation is a rather pricey investment, so I didn’t want to take any chances buying it online and getting the wrong shade. I have been using it for over 2 months now, so I feel it’s the right time to give you the full review you deserve, and hopefully help some of you who are looking to buy this foundation, but need a bit more information (and possibly some convincing!) before parting with your hard-earned money. So is the By Terry Terrybly Densiliss Foundation worth the hefty price tag? We shall see. The By Terry Terrybly Densiliss Wrinkle Control Serum Foundation is a skincare and makeup hybrid, which combines a powerful anti-ageing serum with a fluid foundation formula. It has medium to full coverage, a radiant luminous finish, a lightweight creamy smooth texture and it’s available in 14 shades in warm, cool and neutral undertones. The 30 ml glass bottle comes with a pump and, as far as I know, it has no SPF in its formulation. Cyclopentasiloxane, Aqua / Water, Dimethicone, Polyethylene, Propylene Glycol Dicaprylate/dicaprate, Glycerin, PEG/PPG-18/18 Dimethicone, Dimethicone Crosspolymer, Butylene Glycol, Boron Nitride, Sodium Citrate, Tocopherol, Dextrin Palmitate, Phenoxyethanol, Quaternium-90 Bentonite, Talc, Pentylene Glycol, Parfum / Fragrance, Aluminum Hydroxide, Cyclotetrasiloxane, Lauroyl Lysine, Cyclohexasiloxane, Methylparaben, Tetrasodium EDTA, Disodium Stearoyl Glutamate, Hibiscus Abelmoschus Extract, Polymethyl Methacrylate, Dehydroacetic Acid, Alcohol, Dimethiconol, Silica, Xanthan Gum, Hexyl Cinnamal, Linalool, Palmitic Acid, Limonene, Butylphenyl Methylpropional, Benzyl Salicylate, Hydroxycitronellal, Alpha-Isomethyl Ionone, Geraniol, Eugenol, +/- [CI 77891 / Titanium Dioxide, CI 77492 / Iron Oxides, CI 77019 / Mica, CI 77491 / Iron Oxides, CI 77499 / Iron Oxides]. (T0128/B). Terrybly Densiliss has a silky smooth texture that feels divine and luxurious on the skin! The foundation has a unique satin radiant and luminous finish and it blends like a dream – almost like a mixture of a smoothing primer and a foundation. At first, it feels slightly slippery on the skin, but after blending it sets nicely, although it doesn’t quite fully dry until it’s set with a powder, which suits my dry skin really well. It’s not matte or dewy, but somewhere in between, giving me the right amount of glow and also allowing my natural skin to shine through the foundation. I would say the finish of the By Terry Terrybly Densiliss Foundation is less matte than the Nars Sheer Glow, more luminous than Giorgio Armani Luminous Silk, less dewy than YSL Le Teint Touche Éclat and more radiant than Chanel Vitalumiere Aqua – I hope I haven’t confused you even more, so I’ll let the pictures speak for themselves! 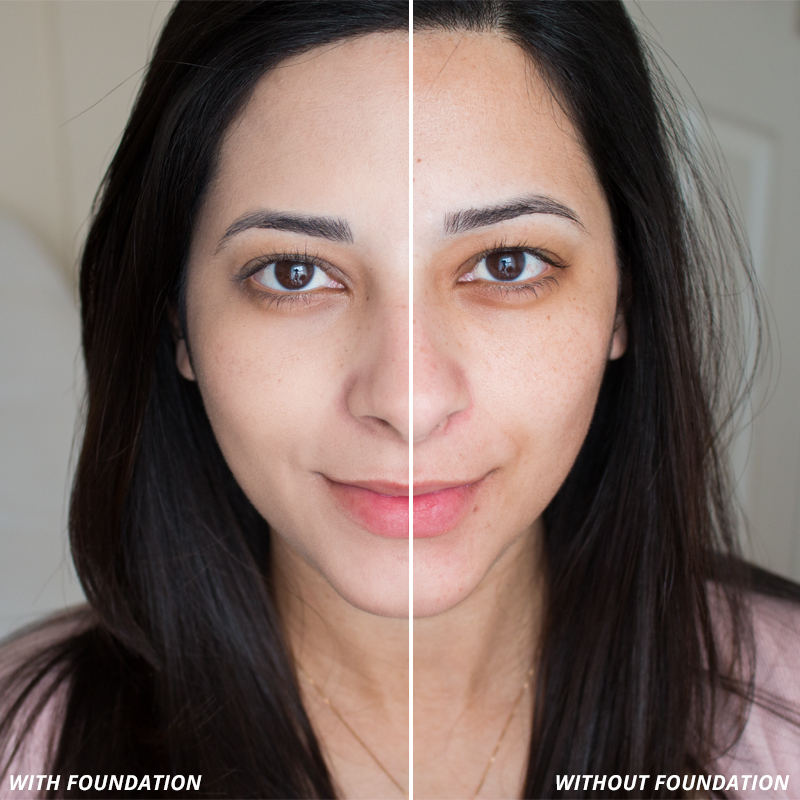 This foundation has a natural-looking medium coverage, which can be built up in layers to full coverage. It covers minor imperfections, redness and evens out the skin tone, all whilst keeping the natural glow of the skin visible. I wouldn’t recommend going as far as full coverage with this foundation, as it defeats the purpose of its beautiful natural skin-like finish and it dulls a bit of its luminosity. Although it doesn’t look cakey or heavy on the skin, after two layers it looks more like any other regular foundation, and on my dry skin, I found that I had to be careful of my dry patches when I applied the second layer of this foundation. 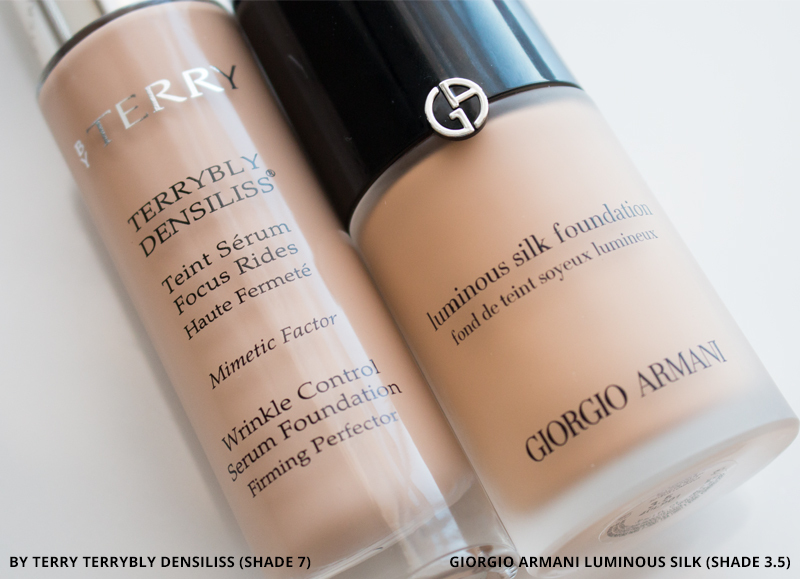 For that reason, I favour the By Terry Terrybly Densiliss Foundation when I want my skin to look naturally beautiful in real-life and I opt for the Giorgio Armani Luminous Silk Foundation for evenings and special events, when I want my skin to look flawless in pictures. 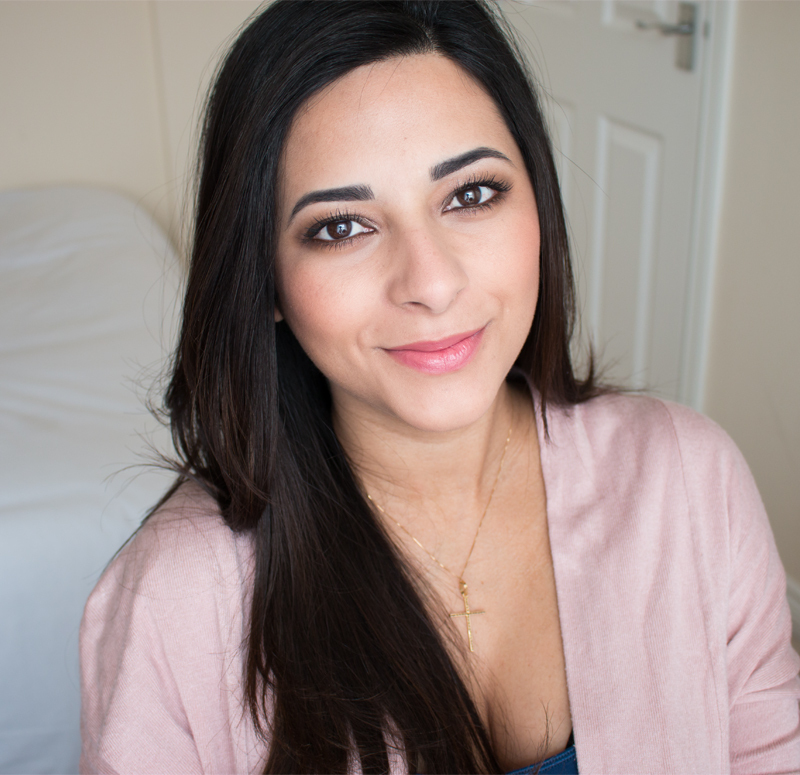 The closest high-street dupe to this foundation I’ve tried in terms of texture, finish and coverage is the L’Oreal Nutri Lift Gold Anti-Ageing Serum Foundation – probably because they are both serum foundations with anti-ageing properties. 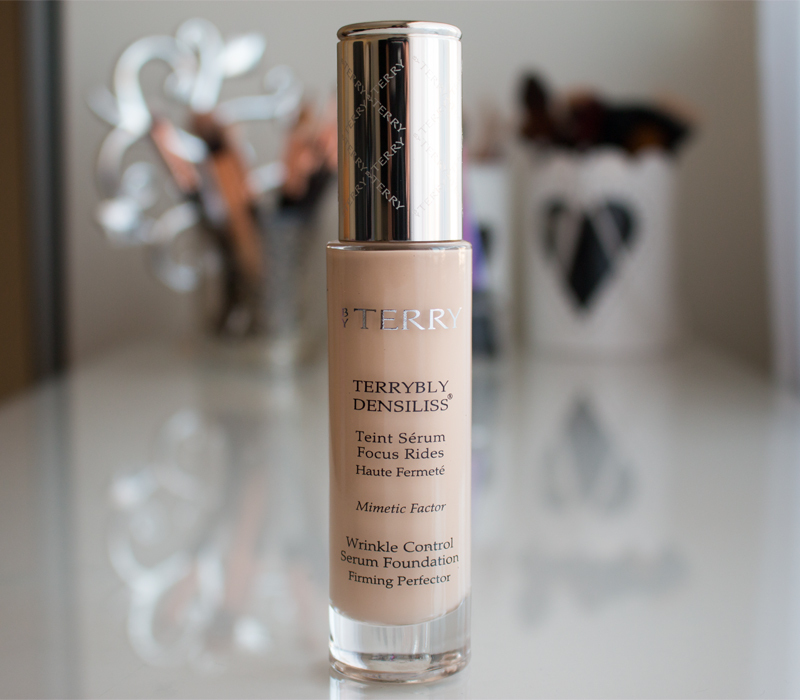 The By Terry Terrybly Densiliss Foundation has a creamy fluid formulation, which feels more like a moisturiser than a foundation on the skin and, in theory, it’s more suitable to dry skin types (although, I’ve read reviews of people with oily skin who also loved it – see Leanne’s review here). This makeup and skincare hybrid gives your skin the benefits of wrinkle control and skin firming properties, whilst covering imperfections and evening out the skin tone. According to By Terry, wrinkles appear smoothed due to the Densiliss technology combined with the mimetic factor (a patented plant active ingredient), leaving the skin texture looking refined and feeling firmer. Put simply, this foundation makes you skin look good on the outside, whilst also working hard on the inside layers to treat the signs of ageing. There are some really high-tech and prime quality ingredients in the whole Terrybly Densiliss line – it’s only when you look deep into what’s actually inside this foundation that you understand where your money is going! Because of its anti-ageing properties, I would say the By Terry Terrybly Densiliss Foundation is more targeted to people in their late 20s and older. Obviously, it will also suit younger skins as well as older skins, but I personally don’t see the necessity to invest in this foundation if you’re in your teens or very early twenties, unless you’re suffering from premature skin ageing or if you are really just keen to see how it looks on your skin – I do warn you, it’s an expensive investment for the ‘I thought I’d give it a try‘ kind of venture! After two months of use, I find the best way to apply this foundation on my skin, and waste as little product as possible, is to dispense one pump onto my finger, spread the product all over my face, and after smoothing and pre-blending, I use a buffing brush like the Zoeva 102 Silk Finish Brush or the Real Techniques Buffing Brush, to blend the foundation seamlessly into the skin. The more I buff, the better the By Terry Terrybly Densiliss foundation looks on my skin! It really applies and blends like a dream – I can’t say that I’ve ever tried a foundation that needs so little product to make such an instant difference on my skin. I wouldn’t dare applying this foundation with a Beauty Blender because of how much product the sponge would soak up during the application; it would just break my heart (and my purse)! As I mentioned above, the L’Oreal Nutri Lift Gold Foundation comes really close to this foundation in terms of how it applies and the finish it leaves on the skin. Before Foundation Tips: I haven’t found any concrete information that this foundation contains SPF in its formula, so apply a separate one. 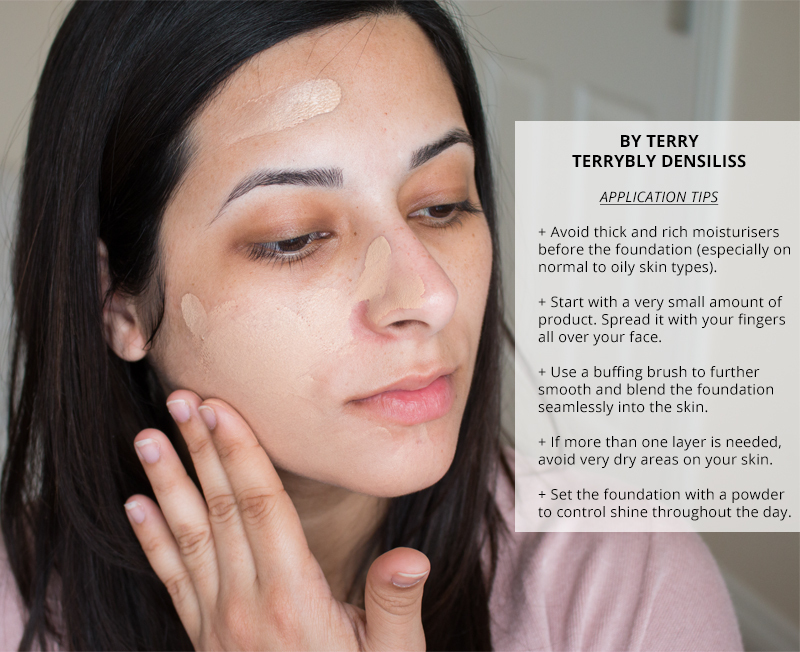 However, whatever you put on your face, make sure it’s lightweight enough and easily absorbed into the skin, or it can make the By Terry Terrybly Densiliss Foundation too slippery and tacky on the skin. After Foundation Tips: Even on my dry skin, I found that I needed to set my skin with a powder; choose a translucent powder if you don’t need any extra coverage. After a few hours, you will most likely start to look a bit shiny, so top up your T-zone with a blotting powder to keep shine at bay. 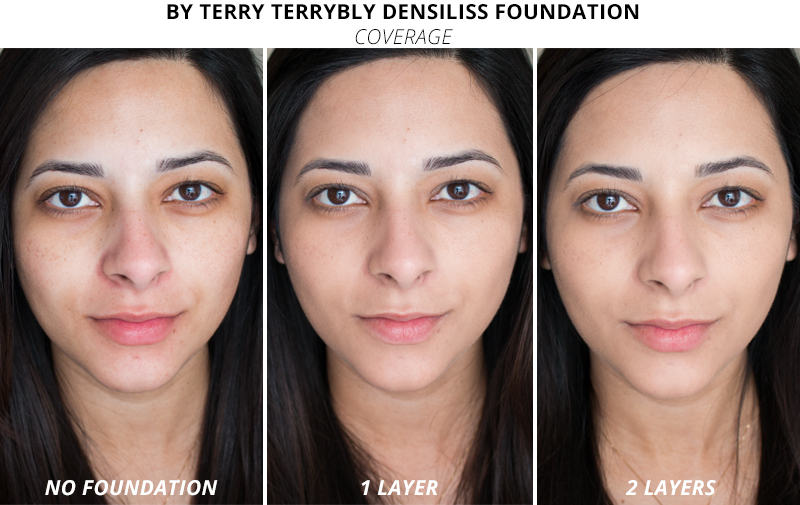 There are currently 14 shades in the By Terry Terrybly Densiliss foundation range, which cater to most skin tones and offers a fairly decent choice of undertones. I would highly recommend doing your research online, but getting yourself matched in a makeup counter; some of the shades are too similar to tell the difference by looking at online swatches, and if you make a mistake with your shade, it will be a rather expensive mistake. According to my research, I narrowed my options down to shades 4 (Natural Beige), 7 (Golden Beige) and 7.5 (Honey Glow); after trying all three of them, shade 4 was too pale and shade 7.5 was too warm, so I ended up with shade 7 (Golden Beige), which the perfect match for my skin tone and the closest match to my skin’s neutral undertone. I knew it would probably end up being a bit light for me if I got a tan, but overall, it was the best fit for my skin all-year round. Here is a list of all the shades currently available: 1 (Fresh Fair); 2 (Cream Ivory); 3 (Vanilla Beige); 4 (Natural Beige); 5 (Medium Peach); 5.5 (Rosy Sand); 6 (Light Amber); 7 (Golden Beige); 7.5 (Honey Glow); 8 (Warm Sand); 8.25 (Desert Beige); 8.5 (Sienna Copper); 9 (Intense Mocha); 10 (Deep Ebony). 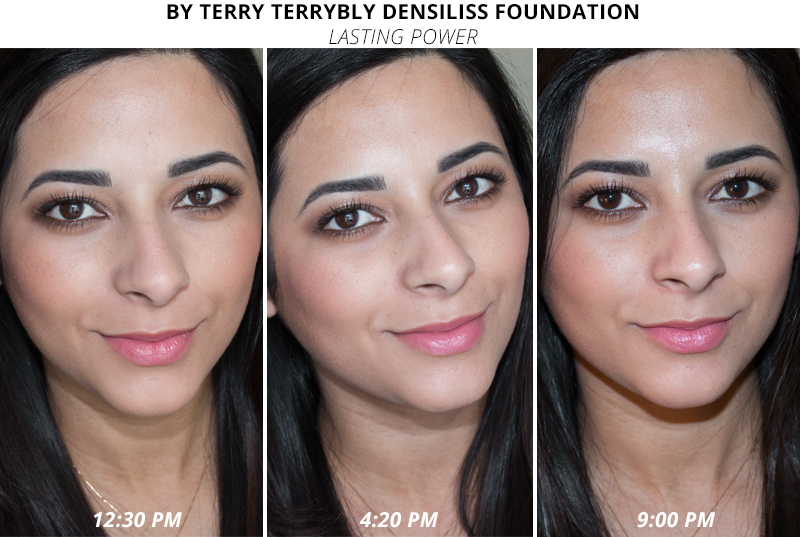 The By Terry Terrybly Densiliss Foundation lasted well on my skin for about 8 hours without touch-ups. As you can see on the picture above, even though the overall look of my skin remained pretty good, minor signs of fading around my nose and shine on my T-zone started to appear after about 4 hours of wear. At about the 8.5 hours mark, the foundation still hadn’t creased, gathered on fine lines or faded patchy anywhere else on my skin, and the rest of my makeup was still looking almost intact! But things were looking pretty shiny on my forehead and this was a real surprise to me, as I’ve never had any problems with shiny skin, even after a long day. I did notice some shine in real-life, but it was only when I looked back at my pictures I took with flash that I realised how shiny I looked; I think that was due to a combination of factors: applying the wrong moisturiser, pregnancy hormones and the actual texture of this foundation. So, note to self: do not forget to powder. This foundation performed extremely well under flash photography with no flashback or white cast over my skin. 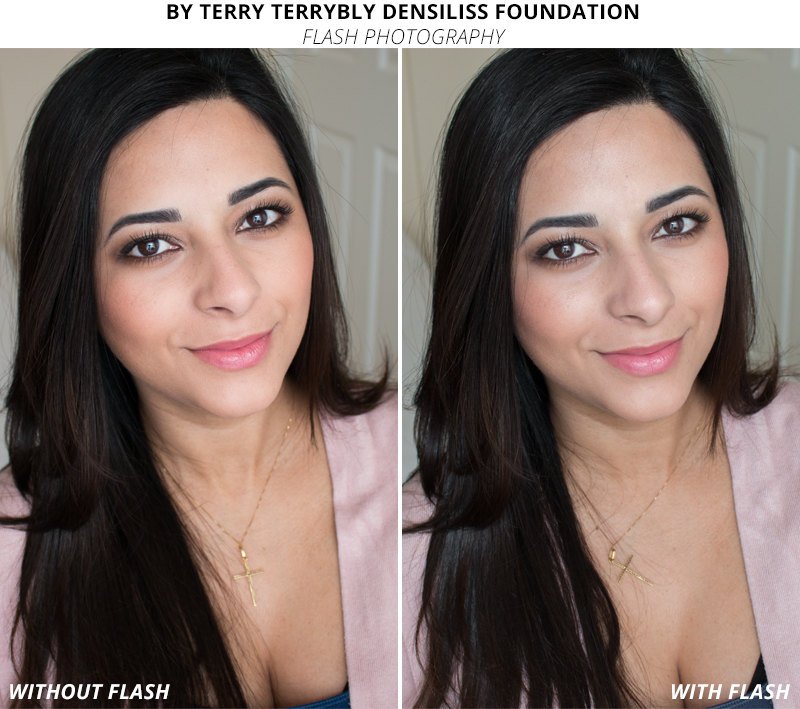 As I mentioned above, I’m pretty sure the By Terry Terrybly Densiliss Foundation doesn’t contain SPF, which would make sense, considering how beautiful it looks under flash photography, but I’m not 100% sure – if you have that information, please leave it on the comments below. 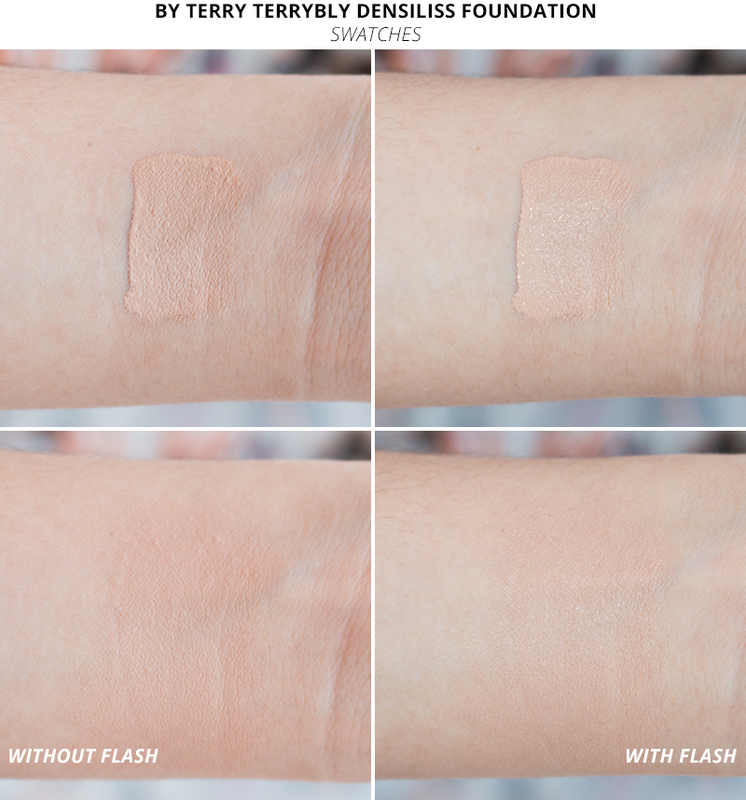 Unfortunately, the beautiful natural glow that this foundation gives in real-life, tends to transform into a bit of shine under flash photography, so if you’re looking for a foundation for evenings or special occasions, the Giorgio Armani Luminous Silk Foundation is a bit more reliable for flash photography with its matte luminous finish. In my opinion, the By Terry Terrybly Densiliss Foundation deserves the high praises it gets and it more than lived up to my expectations. It’s a luxurious foundation that makes my skin look naturally perfected from the outside, whilst deeply treating the signs of ageing from the inside. I love how my skin looks when I wear this foundation and the shade I picked (7 – Golden Beige) is a great colour match to my medium olive skin tone and neutral undertone. Although I was a little surprised to find myself looking shiny on flash photography, I don’t think the foundation was entirely to blame here, and it would have probably performed better if it wasn’t for my pregnancy hormones. However, I am well aware of its excessive price tag, and that’s the one thing that stops me from recommending the By Terry Terrybly Densiliss foundation to everyone and anyone. Is it a an amazing foundation? Yes. Does it do exactly what it says on the tin? Yes. Is it worth the money? Yes – but only if you have that kind of money to spend on makeup and if you’re the target-market for this foundation, as I mentioned on the ‘Formulation’ section above. It’s not for everyone and definitely not irreplaceable. For half the price, you can get the Giorgio Armani Luminous Silk Foundation, which is also a luxury foundation and my all-time favourite. But even better, for a fifth of the price, you can get the L’Oreal Nutri Lift Gold Foundation, which is a great dupe for the By Terry Foundation and very similar in finish, texture and formulation. The By Terry Terrybly Densiliss Foundation costs £76 / $115 for a 30ml glass bottle, and you can get it from Space NK in the US and in the UK. You can also get it from StrawberryNET.com, from Beautylish.com or from Beauty.com, but availability worldwide is fairly limited. 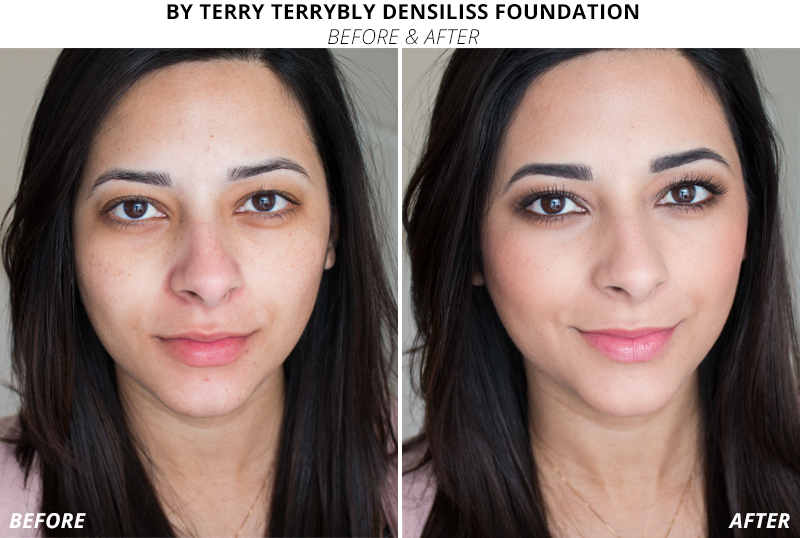 Have you tried the By Terry Terrybly Densiliss Foundation? Do you think it’s worth the price tag? I’d love to hear your thoughts! NOTE: The photos have only been edited to correct colour and light; they have not been retouched. What an utterly fantastic review! I’ve never seen one so detailed like this before! I’m glad you liked the foundation as it is pretty expensive, this is such a great resource for anyone who is considering buying it. Loved this review! I have a couple of samples of this at home so I may have to crack them out. I have sampled the By Terry Sheer Expert and it was ok, I wasn’t impressed enough to purchase it though. By the sound of your review, this one would be much more suited to what I want in a foundation.